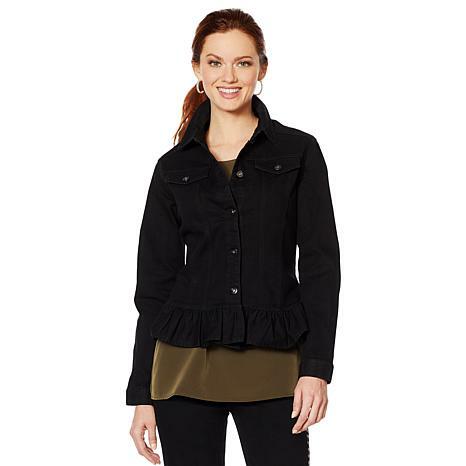 A ruffled hem adds a feminine finish to a this classic jean jacket. Layer it over your sundresses and shorts-and-tee ensembles when there's a chill in the air. Just received this jacket and it is really cute! it does have stretch and fits very well. I got it true to my size. I think I will get another color. I would definitely recommend it. The ruffle on the bottom really makes it. Love love this jacket. Not only is it super cute, it is wear all day comfortable. I'm planning a trip overseas this summer and I am thinking about wearing this and the matching DG2 virtual stretch Jean's on the plane. They are that comfy! Love! I am waiting for a smaller size to be delivered but I LOVE this jacket and bought 2 - denim dark and black. Maybe if they go on sale, I'll but more.I plan to belt and wear with my Armani skirt. I purchased the Olive in XS and fit is perfect for my small 89 lb frame. Love the ruffles. I purchased 2 of these denim jackets! I ordered my size medium and they fit perfectly ! Great stretch! Love the ruffled details on the bottom! Look great with any style top and bottom!